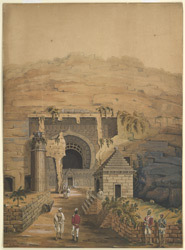 Water-colour by James Broff Byers of the entrance to the cave temple of Karle, dated 1815. Inscribed on reverse: 'View of the Entrance, or External Appearance of the magnificent Cave of Karlee situated between Bombay and the Mahratta city, Poonah. The original sketch from which I have now made this drawing was taken on my first visit to this wonderful spot, in Decr. 1805. Shooter's Hill 1815. JBB'. Note: Between June 1804 and December 1805 Byers was employed in surveying the route being taken by an army division through Malwa and Rajputana. In 1815 he was on leave in England. The Great Chaitya or prayer hall at Karli was excavated during the phase of early rock-cut architectural activity in India. A courtyard precedes the cave, with a huge 'simhastambha', a column with a bell shaped capital topped by four lions. The facade of the cave has a wide horseshoe-shaped window with ribs. The porch cave is adorned with very fine carvings depicting mithunas or amorous couples positioned between the three arched doorways. On the side walls there are three-dimensional carvings of elephants trunks which support multi-storey buildings with arched windows and railigs. These sculptures date from 1st century BC to 1st century AD.